When Something Else by the Kinks was first released in 1967, it must have been an absolute revelation. The album can be seen as singer and songwriter Ray Davies' statement of resignation from the fashionable Mod movement that first put his band the Kinks on the musical map, and his settling down as a social commentator and chronicler of the ordinary lives of the ordinary English men and women that he felt much more akin to. Not to devalue the other Kinks' roles in developing the songs, most notably Ray's brother Dave Davies. In fact, Dave and Ray co-wrote the fantastic Death of a Clown on the album, and wrote the songs Love Me Till the Sun Shines and Funny Face. But it was the songs Ray wrote that made the album a landmark release. His songs are less bombastic than Dave's, and more effortlessly cool - End of the Season's relaxing lilt is a prime example. But absolutely no song on the album can compare to the iconic closing track, Waterloo Sunset. The song's lyrics are brilliant and poetic, detailing a solitary man's personal feelings on viewing a couple embracing at a train station. Acceptant of his own lot in life, the man doesn't lament that he lives his life alone, but instead finds enjoyment and fulfillment in the bucolic sunset at Waterloo Station. The song had an original enough sound for the 1960s, utilizing a tape-echo that hadn't been employed in popular music since the previous decade. Steve Marriott of the Small Faces reportedly begged Ray Davies to let him know exactly how he had recorded the song. 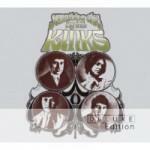 So, yes, of course Something Else by the Kinks is an amazing album and worthy of the respect it receives. The pressing concerns with this reissue is whether or not it does the original music justice, and whether or not it adds anything worthwhile to the previous package. Sadly, this reissue isn't really that remarkable. Tacked onto the brilliant original album are a bunch of throwaway alternate mixes and already previously-released singles. I suppose it is very likely that someone who is interested in how the songs on the original album developed during the recording process will find a certain enjoyment from the added songs present on this reissue. However, viewed from their own merit, these added songs are lackluster, and mar what had already been a perfect package. The record company should have left them off and instead have focused more on restoring the original music to today's higher audio standards. The lazy reissue is an all-too-common occurrence in the modern music climate, where major labels figure they can make some dough off uber-fans by slapping a few junk takes and a little blurb about the band on top of a classic album and calling it a reissue. If this were the original album by itself that I was reviewing, I would give it a perfect ten. But, the sheer laziness of this reissue manages to devalue the original package slightly, which is why I had to dock its score slightly.